You may consider applying for financial grants for educational purposes. Students can acquire educational grants from the financial aid office of their universities. The best thing about grants is that you don’t have to pay them back. The only hurdle is qualifying — which isn’t necessarily easy. Excellent high school students are frequently awarded merit-based scholarships, which also do not need to be repaid. The qualification for these scholarships varies, but often requires the student to have great grades and high scores on scholastic aptitude tests. Some students work on a part-time basis to generate funds for their education. To this end, you may consider applying to your university to see if employment opportunities are available. The U.S. Government currently provides a 60 percent wage subsidy to employers of students engaged in work-study programs. On-the-job training opportunities and internships may allow you to to combine class attendance with full-time work. Although internships do not provide big financial compensation, they do allow students to gain practical experience, enabling them to decide about their major and possibly resulting in a job offer from the company they worked for. By requesting private education loans from your friends and family, as well as from various other private sources, you may be able to cover hefty fees and pay them back in installments. Student loans can usually be arranged at either fixed or compound interest rates, which normally require a financially sound co-signer and a credit check if the loan provider is not satisfied with or unaware of your credit history. Many people believe that it is nearly impossible to repay students loans, but that’s not true; there are organizations that provide counseling for students to help them with their repayment structure. Students may be able to get tax deductions in addition to credits towards tuition, costs, fees, and interest from student loans. However, these options are only available after paying tuition fees, and are more like rebates than discounted tuition. You can learn more about education tax breaks on the internet at government tax sites. Families can also qualify for tax breaks for their children’s education. Although I disagree with the title of this infographic (I think instead of “best” it should read “most famous” or “most expensive”), here’s an interesting look at prep schools across the country. Did you go to a prep school? What was your experience? Intro by Marcela De Vivo. Graduation, whether you’ve just earned your bachelor’s degree or master’s degree, is definitely a major accomplishment. While pursuing higher education can bring some great benefits, it can be a huge financial investment and at times a burden. For this reason, students should really think about how they plan on paying for college or graduate school. Trying to find financial aid for school can often turn into a full time job; as more and more grants and scholarships see their funding reduced, students are forced to look into more accessible forms of financial aid like student loans. More advanced degrees such as a J.D. tend to cost even more. In 2013, the average law school student graduated about $124,000 in debt. Although the costs of education can be high, it’s still a worthy investment, as statistically college graduates earn significantly more than those without degrees — and the higher your degree, the more you earn. 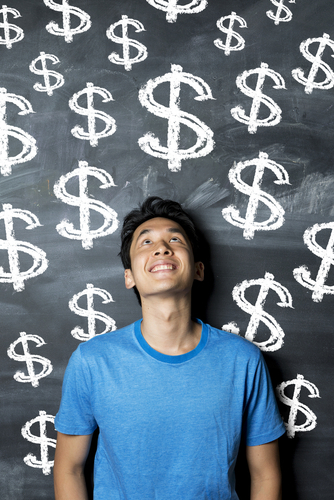 Paying for school can seem intimidating and challenging, but with smart saving and budgeting skills, finding funds for a degree can become the least of your worries. Student loans can be a time-saving way to find financial aid, but students should always compare and research different loans to find the ones that have the best interest rate and payment plans. To get a sense of just how much grads can end up paying for law school, and to learn some money saving tips that can help you get rid of student debt quickly, check out this infographic on law school costs. You need great grades to get into law school. Order your copy of The Secrets of Top Students today!